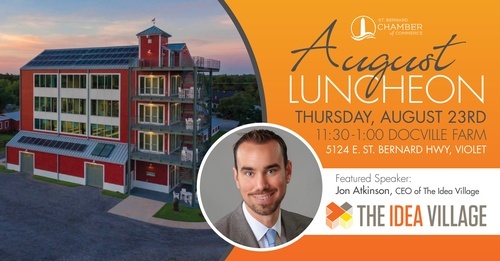 Please join the St. Bernard Chamber of Commerce on Thursday, August 23 from 11:30-1 pm for our August Luncheon, featuring Jon Atkinson, the new CEO of The Idea Village. The Idea Village, a nonprofit dedicated to engaging the New Orleans community to embrace innovation, entrepreneurship and new thinking. The Idea Village has established itself as a globally recognized leader in developing place-based entrepreneurial ecosystems. The Idea Village is committed to sustaining the local entrepreneurial movement by providing direct services to entrepreneurs, engaging the community, and supporting initiatives that leverage entrepreneurship to catalyze change. Atkinson was announced as CEO in late June, and he brings a background in finance, investment and education to his new position. We look forward to welcoming Jon as our featured speaker, and learning more about the work that The Idea Village does in our region. The luncheon will be held at Docville Farm, 5124 E. St. Bernard Hwy. Violet, La 70092.